A three storey seven bay central block with flanking pedimented wings attached by walls punctured by round arched windows, Mount Bellew’s remains lie close to the town of the same name in Co. Galway. 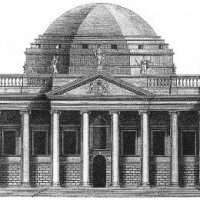 Neale illustrates the main facade breaking forward at its extremities into tripartite bays which frame the central feature of a doorway capped with an oversized urn and a Venetian window above. However in reality the Venetian window rested behind a somewhat smaller urn, and the upper window mimicked the Venetian but lacked a central arch. Nor is the porch and two free-standing columns clearly defined in Neale’s depiction. The pedimented wings exhibit Wyatt windows capped with blind segmental arched tympanums (not rounded as in Neale) and two inward facing animal statues (whether lions or dogs is unclear) stand proud over the pediments completing the composition. 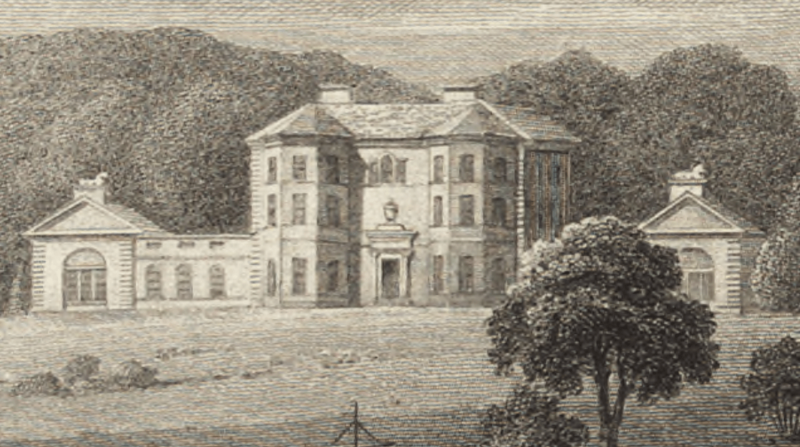 The house dates to the eighteenth-century and as noted in Neale’s account was altered in the early nineteenth-century. It did not survive the architecturally turbulent 1930s unscathed however. The estate was brought into the Land Commission portfolio in 1937 and the house was demolished in 1939 to provide stone to repair roads, at the reported outcry of the local inhabitants. 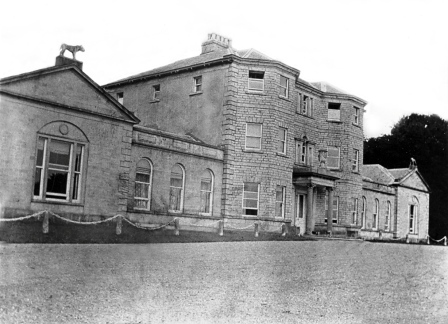 “This pleasing Residence is situated about fourteen miles from Ballinasloe, upon one of the great roads from Dublin to the western parts of Ireland. The House stands on a gentle swell, nearly half a mile to the South; between it and the road, runs the Shivan, spreading to a considerable expanse, as it proceeds eastward; the varied outline it then assumes, its wooded islands, and lucid waters bathing the opposite acclivity, form together a scene of no ordinary interest and beauty. The Demesne extends by sunk fences across the road, which divides it almost into equal parts: that on the north side displaying Grounds tastefully laid out, Plantations sweetly grouped, or thickening into masses, over which the eye passes to a blue mountain in the distant horizon. As the river advances, it spreads to an extensive lake; shewing to the traveller, by openings judiciously made, the Mansion on his right, with its scenery in parts descending to the water’s edge; while on his left, he is forcibly struck with the Church, its Tower, and Pinnacles, with all the distinctness of reality, presented on its bosom. Winding from hence, or a little more easterly, it takes a direction to the South, and is lost in a deep wooded glen, after passing a bridge of many arches, over which the Eastern Approach to the Mansion runs through Woods and Lawns, by such sweeps as these admit of, to the Terrace in Front, where it connects with the Northern Avenue, and thence to the adjacent Offices. The Mansion is elegant and commodious; the Hall is in three compartments, divided by screens of Ionic columns; the entire length is 63 feet, by a proportional width and height. Ante-Rooms connected with the Hall, each 24 feet by 17 feet, 8 inches, open into a Gallery on one side, 32 feet by 26 feet, 17 feet high; and on the other side into a Dining Room, 34 feet by 21, 20 feet high. The apartments contain a chosen collection of cabinet Pictures, another very extensive one of Prints, including those of all the Royal Cabinets of Europe: the famous one of the Louvre, Le Muse Frangais, not excepted; and, perhaps, the best private Library in this Kingdom. Sir John Bellew, of Welly’s town, in the County of Louth, who represented that County in the Irish Parliament of 1639, married Mary, the second daughter of Robert Dillon, of Clonbrock, Esq., and was transplanted to the County of Galway, by the usurper Cromwell: at the Restoration he recovered part of his Estates in Louth, and settled at Bellew Mount, otherwise Barmeath„ in that County. Christopher, his second surviving son, remained at Mount Bellew, and from him, in uninterrupted succession, descends the present Proprietor.